The weight of the AC 50 motor is around 115 pounds. This motor is also very popular in the mining industry. We manufacture an enclosed (not water proof) version of this motor that is used for personnel carriers. Link to power graphs: AC-50 POWER GRAPHS!! Of course all our systems are backed by an HPEVS warranty. 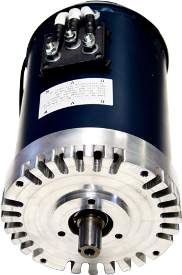 There are 8 options to choose from for your AC-50 motor. Click on the model numbers below to see all the stats on the HPEVS website to help with your decision. There are 2 ways to get an exact quote for the base shipping for your HPEVS AC-50 EV AC Motor (AC 50-16.02, AC 50-18.02, AC 50-26.26, AC 50-26.28, AC 50-27.28, AC 50-30.29) order. We’ll research the exact shipping cost and send you an invoice to your PayPal or email or you can add it to your pallet in $1 Shipping Increments for your HPEVS AC-50 EV AC Motor (AC 50-16.02, AC 50-18.02, AC 50-26.26, AC 50-26.28, AC 50-27.28, AC 50-30.29) order.